A strata is great because, like a frittata or omelette, you can use whatever you have on hand and it'll work. That's what prompted me to make an Italian strata this past weekend. Zucchini, sausage, peppers...the combination was delicious. Spray a 9x13 pan. Cook sausage in a skillet until brown. Remove from skillet and chop into bite size pieces. In a large bowl, beat eggs, milk and spices together. Add bread and mix so all pieces are soaked in egg mixture. 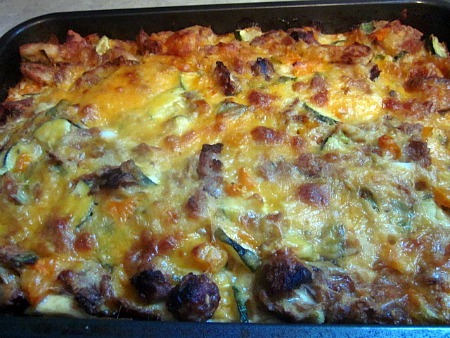 Add sausage, 1 1/2 cups cheese, and vegetables. Pour mixture into pan and top with remaining cheese. Cover and refrigerate overnight. When ready to bake, uncover, and heat oven to 350 degrees. Bake for 50-55 minutes or until a knife cleanly comes out of center of pan. Let stand for 10-15 minutes before cutting. We have strata every year for Christmas breakfast and it's my absolute favorite! I am addicted to sausage. I could honestly be a complete vegetarian if it were not for sausage. So needless to say... this looks yummmy. Omg I could eat this anytime of the day! 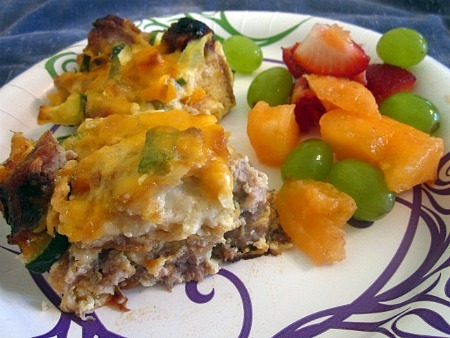 So hearty and good - love that you used zucchini! I want this as breakfast-for-dinner. Which is my favorite meal of the day, by the way. Looks delicious! Great idea to prepare it ahead! THanks for linking up to our Flu Fighting Foods blog hop. we'd love to see you tomorrow with a green tea recipe!